The network that cried, "(Fake) Shark!" After an utter failure of a #sharkchat with Shark Week on Twitter (where the main topic was ice cream), already fed up scientists absolutely exploded when it came out that the supposed shark of Lake Ontario (who already had a twitter account) was all an elaborate hoax by the very program that once worked to promote a positive shark image. If you hadn't heard about Sharktario, the Lake Ontario shark, we can fill you in. A grainy video showing kids fishing in a freshwater lake and a mysterious critter suddenly snaps up to take the bait, disappearing back under as quickly as it appeared. The video continues with repeated slow motion recounts, as well as close ups. However, even when zoomed in the picture was grainy and left scientists and the general public baffled. Or was this really a shark? I'll admit it: I fell for the bait. It was a hot topic among my mates. I looked over the video and wrote a piece with trackingsharks.com that analyzed the video, capturing screen shots (like, two) stating why, in my professional opinion, I thought this animal was a small bull shark. The blurry teeth shown at 00:49 were similar to a bull shark, and the fin was too rigid to be a catfish or other fish. However, the flexibility it showed once diving down was too much for a shark. Scientists and community members continued the debate, some stating it even looked like a porpoise. I guess that should make me feel better, that I wasn't the only one duped, but instead it angers me - and countless others- that a once respected program could do such a thing. Giving credit where it's due, some did call it out as a hoax... but none foresaw this big a betrayal. That a program that once promoted a positive shark image and education has resorted to fear mongering, sensationalism and ice cream ads (no offense, Cold Stone, I love your ice cream) is frustrating and disheartening, to say the least. 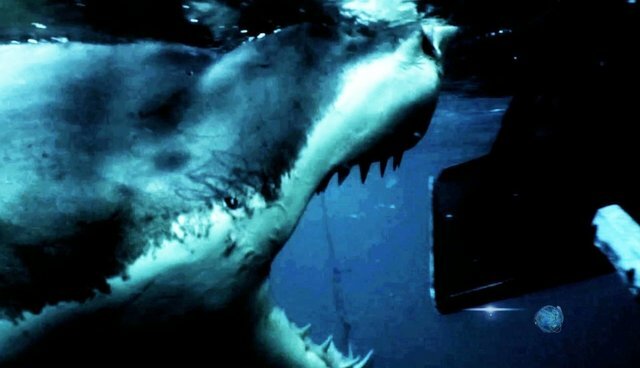 As Discovery Channel continues to rake in viewers who are attracted to mockumentaries and dramatized shark attacks, it loses the audience that will actually make a difference: conservation - minded citizens. Shark Week, many viewers are absolutely disgusted with you right now. I am one of them. However, you can count me as one of your viewer numbers this year and every following year. It's to take down your false science and combat it with real shark education, and hoping my voice, with many others, is stronger than the screams coming from your shark attack shows. Enough is enough. How long will it take you to realize that, Shark Week?